To Cite: Bahadori M, Ghardashi F, Izadi A R, Ravangard R, Mirhashemi S, et al. Pre-Hospital Emergency in Iran: A Systematic Review, Trauma Mon. 2016 ; 21(2):e31382. doi: 10.5812/traumamon.31382. Context: Pre-hospital care plays a vital role in saving trauma patients. Objectives: This study aims to review studies conducted on the pre-hospital emergency status in Iran. Data Sources: Data were sourced from Iranian electronic databases, including SID, IranMedex, IranDoc, Magiran, and non-Iranian electronic databases, such as Medline, Embase, Cochrane Library, Scopus, and Google Scholar. In addition, available data and statistics for the country were used. Data Selection: All Persian-language articles published in Iranian scientific journals and related English-language articles published in Iranian and non-Iranian journals indexed on valid sites for September 2005 - 2014 were systematically reviewed. Data Extraction: To review the selected articles, a data extraction form developed by the researchers as per the study’s objective was adopted. The articles were examined under two categories: structure and function of pre-hospital emergency. Results: A total of 19 articles were selected, including six descriptive studies (42%), four descriptive-analytical studies (21%), five review articles (16%), two qualitative studies (10.5%), and two interventional (experimental) studies (10.5%). In addition, of these, 14 articles (73.5%) had been published in the English language. The focus of these selected articles were experts (31.5%), bases of emergency medical services (26%), injured (16%), data reviews (16%), and employees (10.5%). A majority of the studies (68%) investigated pre-hospital emergency functions and 32% reviewed the pre-hospital emergency structure. Conclusions: The number of studies conducted on pre-hospital emergency services in Iran is limited. To promote public health, consideration of prevention areas, processes to provide pre-hospital emergency services, policymaking, foresight, systemic view, comprehensive research programs and roadmaps, and assessments of research needs in pre-hospital emergency seem necessary. The second most common cause of death in Iran is road accidents (1), with 57% of victims succumbing to their injuries before reaching the hospital (2). Over the past decade, 235,050 people have been killed and 2,0221,000 people have been injured in motor vehicle accidents. According to the available statistics, in 2012, Iran reported 1,160 injuries and 26.75 deaths per 100 thousand people (3) as a result of road accidents (4). Road accidents victims comprise 31.9% of patients needing emergency medical services. In 2009, the financial burden of road accidents in Tehran province itself was 0.3% - 0.4% of GDP. In the same year, the total costs of healthcare services due to road accidents was estimated at about 2,952 billion Rials, of which 87%, 12%, and 1% accounted for hospital, pre-hospital, and rehabilitation service costs, respectively (5). The proper transfer of those injured and other patients, a pre-hospital emergency task (6), can significantly reduce costs. Pre-hospital emergency medical services are a set of immediate emergency medical services and skills provided by the Iran medical emergency network before taking a patient to the hospital in emergencies such as accidents, acute illnesses, and natural or man-made calamities (7). The history of pre-hospital emergency medical services in Iran dates back to 1975. Following the collapse of the Mehrabad airport roof, which killed and injured numerous people, the former ministry of health set up a system that could meet people’s needs for emergency medical services. As a result, the Tehran emergency center was designed and launched, after which several other emergency centers in other provinces were gradually established. In response to the repercussions of war and increasing urban populations, emergency medical services 115 began using its equipment and facilities to provide free emergency medical services and took steps toward expanding the provision of these services throughout the country. Today, 2,187 emergency road bases have been set up, providing free services to the injured, patients, and those in need (7). Pre-hospital emergency, a subset of the disaster and emergency medical management center, also made efforts to increase the quantity of emergency bases and has developed and implemented programs aimed at improving the quality of pre-hospital emergency medical services (8). The regulation on the “[o]rganization of comprehensive coverage of pre-hospital emergency medical services,” which was implemented in 23 articles in 2007 and conveyed to all administrative units, included the following pre-hospital medical services as part of the network: communications or message center and urban, temporary road, air, rail, and coastal bases. The pre-hospital emergency medical services in Iran are being monitored since 2010 (7). Pre-hospital care plays a vital role in saving the lives of trauma patients (9). Several factors have been known to contribute to the effectiveness of pre-hospital care, including an accurate information system, access, ambulance equipment, employee skills, average time an ambulance takes to reach the injured and patients, dispatch and communications network, proper transfer of the injured and patients, and type of care (10-12). Several global studies have considered various qualitative and quantitative indicators in evaluating pre-hospital medical services (13-15). Although several studies have been conducted on the pre-hospital emergency status and its indicators in Iran, there is no comprehensive study, to the best of our knowledge, that discusses its current status. Thus, considering the high number of road accidents in Iran, this study aims to examine available related studies to identify research gaps and limitations in the pre-hospital emergency status in Iran. In line with the objective of this study, articles published on the pre-hospital emergency status in Iran were systematically reviewed. The researchers used the Preferred reporting items for systematic reviews and meta-analyses (PRISMA), which is a standard guideline for systematic reviews containing 27 items (16). First, the related literature and publications for basic information on the pre-hospital emergency services in Iran from 2005 to 2014 were reviewed by referencing documentation and library resources and the Ministry of health and medical education website (disaster and emergency medical management center) [available at http://demmc.behdasht.gov.ir]. We included Persian- and English-language articles published in scientific journals and whose full texts were available as well as related studies conducted in Iran. We excluded letters to the editor and articles in invalid journals, published in both the Persian and English languages with the same title and topic, and those whose full text we could not access. To review the selected articles, a data extraction form, developed by the researchers in line with the aim of study, was used. The form included sections for the characteristics of each selected article, including the authors’ name, year of publication, study objectives, type of study, materials and methods, data related to pre-hospital emergency indicators, features of pre-hospital emergency in Iran, and the results. Two researchers were involved in the selection of contents and data extraction. The main characteristics of the selected studies and their results are summarized on the basis of the following variables: pre-hospital emergency indicators, type of study, target population, study approach, language in which the study is published, and year of publication. - Pre-hospital emergency indicators: On the basis of the literature review and international standards, the pre-hospital indicators were classified into two categories: structure and function. - The structure-related indicators consisted of policies, facilities, equipment, power and energy supply, basic knowledge of caregivers, and communications and transportation networks. - The function-related indicators comprised the processes in and outcomes of pre-hospital emergency, which included medical protocols, protocols of care, drug prescriptions, pain relief, survival and staying alive, and injured and patients’ satisfaction. - Types of studies: Studies were classified on the basis of their design type: interventional (experimental) studies, cross-sectional descriptive studies, descriptive-analytical studies, qualitative studies, and review articles. - Target population: Here, the studies were divided into four categories: experts, employees, injured, and bases of emergency medical services. - Study approach: The approaches of studies were identified as per the following items: description and comparison of the current status, identification and evaluation of pre-hospital emergency indicators, and factors affecting the performance of pre-hospital emergency. - Language of study: This variable indicated if the study or article was published in the Persian or English language. - Year of publication: The variable was divided into two groups: 2005 - 2009 and 2010 - 2014. Database searches were conducted until September 2014 using the mentioned keywords and search strategies and accordingly, 35 articles in 135 Persian journals and 48 articles in 242 English ones were selected. The titles and abstracts of all articles were systematically studied on the basis of their relationship with the studied topic and the inclusion and exclusion criteria. At this stage, 36 articles (17 articles in Persian and 19 articles in the English language) were included in the study, of which three articles were excluded owing to the lack of access to their full texts and five because they had been published in both the English and Persian language. Next, from the 28 shortlisted paper, we excluded articles that did not meet the inclusion criteria and included those with complete data and more relevant to the aim of the present study, which were then assessed by two independent judges and experts in pre-hospital emergency. As a result, a total of 19 articles were selected. The flow chart of the literature review and data extraction is presented in Figure 1. The publication of articles on pre-hospital emergency in Iran has increased considerably in the past few years. The results showed that four articles (21%) had been published from 2005 to 2009, which increased to 15 articles (79%) from 2010 to 2014. These published articles included six descriptive studies (42%), four descriptive-analytical studies (21%), three review articles (16%), two qualitative studies (10.5%), and two interventional (experimental) studies (10.5%). in addition, among these 19 articles, 14 articles (73.5%) had been published in the English language. The focus of the selected articles ranged from experts (31.5%), bases of emergency medical services (26%), injured (16%), and data reviews (16%), to employees (10.5%). Further, 42% of the selected studies described the current pre-hospital status and compared it with the available standards with those of other countries. Most studies (68%) investigated the pre-hospital emergency function and 32% of them investigated the pre-hospital emergency structure. The main characteristics of these selected articles, based on the aim and variables of this study, are presented in Table 1. Following amenities and facilities as appropriate infrastructure, the process and outcome of care provided for the injured and patients are considered as function-related indicators for emergency medical services. Process-related indicators include models of care, treatment, pharmaceuticals and drugs prescriptions, and medical protocols. Outcome-related indicators comprise response rate, pain relief, survival or death, and injured and patients’ satisfaction. The results of the present analysis showed that among the 13 selected articles, eight (61.5%) were related to the outcomes of pre-hospital care, of which five (62.5%) examined the average response time, two (25%) explored transportation and dispatch, and only one article (7.7%) focused on death rates. In addition, five articles (38.5%) were related to the processes of pre-hospital care, in which interventions, effective factors, and barriers were studied. Their results indicated that emergency medical services in Iran were based on a hybrid framework of American and German models in terms of types of bases, accidents, and employees. In addition, the rate of deaths from road accidents in Iran decreased owing to the rapid response time and various process improvements (e.g., employee training). However, the researchers of the current study found no article on pain relief and injured and patients’ satisfaction. 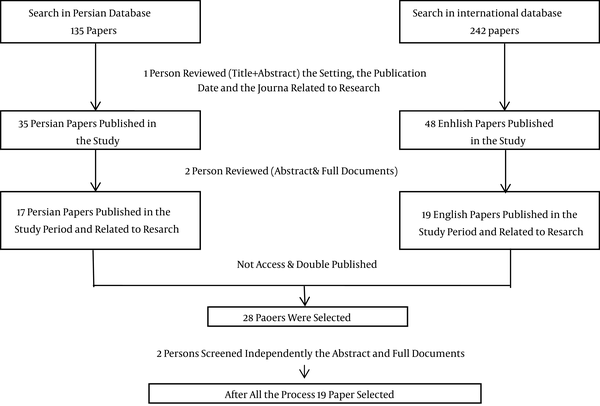 The review results for the selected articles are summarized in Tables 2 and 3. Bahadori et al. (8) Identify and prioritize the components of access to emergency medical services in Iran Third-party insurance per capita, insurance for non-accident events, budget for specific organizations such as tobacco companies, distribution of facilities based on regions, and distribution of facilities in urban and crowded areas were determined as access components. In addition, third-party insurance per capita was considered the most effective component of medical services access. Bahadori et al. (17) Prioritize the components of transportation in emergency medical services in Iran Ambulance type B and C, helicopters, large jet aircrafts, motorcycle ambulances, and support ambulances were determined as transportation components of emergency medical services in Iran. Ambulance type B and large jet aircrafts were found to be the most effective components of pre-hospital emergency transportation. Bahadori et al. (1) Determine the components of the emergency medical services organization and identify their associations and prioritization Pre-hospital emergency organizations should operate independently. In addition, pre-hospital and hospital emergency services should be managed under a single management. Zargar et al. (18) Describe the current status according to components and function Numerous organizations are involved in prevention and disaster management and rehabilitation. An integrated organization responsible for these activities is necessary. There is a gap among financial resources, education, and legislation for high-risk groups. Bahadori et al. (19) Identify care model factors of pre-hospital emergency in Iran The Franco and Anglo models, selection of the most appropriate hospital on the basis of accident type and time, regionalization of emergency medical services, and medical guidance were identified as components of healthcare. Khankeh et al. (20) Review different systems of pre-hospital services in developed and developing countries with emphasis on traffic accidents There are differences in pre-hospital emergency care systems in various countries in terms of their structures, levels of service delivery, and human resources, which have led to the use of different models for service provision. Paravar et al. (21) Examine the characteristics of road accidents victims referred to hospitals in Kashan and type of care provided for them 75% of the accidents occurred in the city and 42% were motorcycle accidents. The average response time was 6.6 ± 3.1. There was no significant difference in the death rate resulting from road accidents between city streets (46 people) and roads outside the city (32 people). Bigdeli et al. (9) Estimate the average response time of pre-hospital emergency medical services in Urmia The average response time inside the city was five minutes, on roads was 10.6 minutes, and in rural areas was more than the others. Overall, 72.5% of the response times were less than eight minutes. Bahadori et al. (7) Describe the status of emergency medical services in Iran The response time in 80% of the cases was less than 15 minutes. 52.3% of the accidents were road accidents. In recent years, pre-hospital emergency education and training has been provided publicly and professionally. In general, although the pre-hospital standards in Iran have improved, they are far from international standards. Soltani et al. (22) Predict response time of Islamshahr’s emergency medical services The average response time was five minutes and 36 seconds with a standard deviation of 4 minutes and 42 seconds. Given a significance level of 5% or higher, time taken to reach the accident site was significantly associations with the time to move toward the accident site and summer and autumn seasons. Nasiripour et al. (23) Evaluate functions and performance of pre-hospital emergency in Iran The response time in urban areas of the country, except in Tehran, was seven minutes and in the rural areas, it was 14 minutes. The overall coverage by the disaster and emergency medical management center was 33%, the number of ambulances per hundred thousand populations was 19.3, the communications coverage was 80%, the rate of first-aid learners among the target population was 58%, and the care model used was a hybrid model. Roudsari et al. (24) Describe status, damage range, and process of pre-hospital care in one or more regions among 11 developed and developing countries Pre-hospital emergency personnel had been trained to provide BLS. At the ALS level, personnel had been trained in intravenous fluid therapy interventions. Few EMTs had also been trained to provide endotracheal intubation. Peyravi et al. (25) Comprehensively review the current status of emergency medical services in Shiraz About 36.2% of the injured and patients had received definitive treatment at the accident scene. The number of deaths at the accident scene before the arrival of an ambulance had decreased owing to the improved response and dispatch time. Along with the increased activities of emergency medical services in Shiraz during the past decade, the death rates in the accident scene had decreased. The triage protocols and standards needed to be improved. Haghani et al. (26) Determine the efficiency of current training methods provided for the employees working in pre-hospital emergency on the basis of working conditions in Iran and compare it with those adopted worldwide Education and training provided in nursing and other disciplines whose graduates are authorized to work in pre-hospital emergency are inadequate. Moradian et al. (27) Carefully review air emergency medical services in the Fars Province The most common reason for emergency medical dispatch by air was traumas. The greatest rescue time difference between ground and air emergency medical services was in Lamerd, in which the transfer of patients by a helicopter was three hours less than that by an ambulance. Alizadeh et al. (28) Decrease unnecessary dispatch of emergency medical services using a computer program designed using an algorithmic approach to trauma care provided by nurses of emergency medical services The trauma dispatch algorithm was effective in reducing (16% vs. 42% - 26%) (P = 0/005). Baharam et al. (30) Evaluate the function and performance of pre-hospital emergency services in Yazd Only 14.3% of the Yazd bases had sufficient human resources. None of the emergency base ambulances had all the required equipment. The greatest shortage was related to medical-vital management equipment, which only 17.4% ambulances had. The best status was related to the equipment of respiratory-ventilation: 97.9% ambulances had them installed. 81.5% of the requests had been responded to in less than eight minutes. Nafisi et al. (31) Study the effects of education and training on death rate and changes in victims’ physiological functions after providing pre-hospital care There was no difference in death rates between patients with and without education and training. The physiological status of victims transferred by trained therapists and technicians was better than others (95% CI 0.98 - 1.24). In this study, we reviewed 19 published articles to provide an overview of the pre-hospital emergency status discussed across different related studies. Despite the increasing number of articles published in the field of pre-hospital emergency services, few studies have examined the structure of pre-hospital care in Iran; nevertheless, these articles describe the current status of pre-hospital emergency. The results showed that the management and stewardship of pre-hospital services in Iran are provided by several organizations such as the disaster and emergency medical management center, Iran road maintenance and transportation organization, and the police, which has led to the disruption of related activities (1, 18). The investigation of pre-hospital emergency systems in developed countries showed that pre-hospital emergency organizations are integrated and independent, pre-hospital and hospital emergency services are managed under a single management, and online medical guidance is the most important characteristic of their pre-hospital emergency systems. In Iran, however, pre-hospital emergency systems are lacking such characteristics (32). A possible solution is a particular organization taking up the responsibility of managing pre-hospital emergency services; investing in the development and improvement of emergency medical services; and improving issues such as public access, research, and coordination of activities including the provision of services for road accident victims (29). However, at present, no specific organization has borne the responsibility of handling road accident victims. In addition, the results of Hatamabadi et al. (2011) showed inconsistencies in the statistics and numbers of road accident victims recorded separately by the police, pre-hospital emergency, and hospitals owing to the inconsistent activities of organizations responsible for pre-hospital emergency medical services (33), which is in line with the results of the present study. Access to emergency medical services is a main factor in reducing deaths resulting from accidents (8). Providing effective and efficient services requires considerable resources. However, due to resource constraints, priorities for greater access to resources and development of emergency medical services should be determined. Roudsari et al. (2006) stated that the low death rate (0.6%) in Iran’s hospital emergency departments can be attributed to weaknesses in the pre-hospital care system and lack of the rapid transfer of the injured to hospitals, resulting in their death before reaching the hospital (34). This highlights the need for greater attention to prevention methods and equipments of pre-hospital emergencies. Bahadori et al. (2012) and Bahrami et al. (2010) revealed that the lack of resources and poor distribution were major obstacles in providing appropriate emergency medical services. The disproportion among the numbers of ambulances, road bases, and road and off-road events, and accidents is related to Iran’s poor resource distribution in emergency medical services (8, 35). Danis (2007) indicated that the obsolescence of existing ambulances and the lack of unified standards for medical education and treatment were the most acute problems in Lithuania’s emergency services and one of the factors contributing to the poor performance of emergency medical services in the country was the bad structure (36). These results confirm those in the present study. Bahadori et al. (2012) in their study considered that health insurance is a key component of access to emergency medical services and plays a crucial role in decisions making regarding the use of emergency medical services. They consider this component as a priority for access to emergency medical services (8, 37). Access can enable various ways to provide care in different countries (6, 17, 20). Although the studies’ results do not approve the absolute superiority of a particular care model in pre-hospital emergency (33), they suggest in the case of systems in which physicians visit the scene of the accident or a patient’s bedside, the death rate is statistically lower, but the difference between the model of care and other clinical outcomes is not significant (7, 19, 38), which supports the findings of the present study. The type and severity of events and accidents, equipment, level of caregivers’ skills and training in pre-hospital emergency, and policies of the ministry of health and medical education determine the type of care model. For example, in countries such as Mexico and Iran, pre-hospital emergency services are provided by persons trained in basic first aid. In Iran, pre-hospital care providers include emergency technicians and nurses who provide services under the supervision of specific physicians, while in most parts of Australia, New Zealand, Netherlands, the United Kingdom, and the United States, pre-hospital emergency services are provided by pre-hospital specialists trained in advanced first aid (38, 39). In Canada, the staff are trained in basic and advanced cardiopulmonary resuscitation (CPR) and physicians are employed in pre-hospital emergency centers; however, only physicians can provide pre-hospital emergency services for the injured and victims (39). In the Netherlands, trained nurses are also authorized to provide advanced CPR in pre-hospital emergency (40). In Iran, the hybrid model of care is used because of the shortages of emergency medicine physicians and ambulances type B (19, 20). Studies have emphasized the need for extensive changes in pre-hospital emergency services in Iran to provide effective care for trauma patients (29, 39). Another component of structure in pre-hospital emergency that has significantly affected the function and performance of pre-hospital emergency in Iran is its communications network. Adnet and Lapostolle (2005) concluded that a key characteristic of the French pre-hospital emergency system was its medical dispatch (41), which is similar to the results of the present study. This study reviewed 13 articles on the function components of pre-hospital emergency, most of which (62.5%) focused on response time. Although considered an indicator, response time alone cannot change the results and outcomes. Advanced equipment and well-trained employees, as well as response time, have the highest impact on outcomes and reduced mortality rates (4, 42). The results of studies conducted in different countries have shown no association between death rate and response time (16, 43). The first 60 minutes after the trauma is called the “golden time.” However, this varies by the type of injury: a head injury would allow a rescue time of up to 4 hours, whereas in the case of severe bleeding, the rescuers would have only 20 minutes (43, 44). In sum, the time interval between ambulance arrival at the injured and patients’ bedside and referring them to an equipped healthcare center is crucial. According to the standards, this time interval (response time) should be less than 8 minutes (33, 34). Roudsari et al. (2006) and Karbakhsh et al. (2009) (34, 45) show that in recent years, the response time in Iran has decreased and emergency services in most cities, except in Tehran, has been close to international standards. However, Iran is yet to achieve success in air emergency services (41). The type of intervention, determined by “the kind of care at the scene,” is closely related to the care model. If a physician is present in the ambulance (German model), the type of intervention, including airway, intubation, and chest tube placement, is considered to be advanced life support (ALS). If the caregivers providing pre-hospital emergency services are medical emergency technicians who have an associate’s degree in medical emergency, the intervention is classified as basic life support (BLS). The results of most studies indicating low employee knowledge and the need for more training (10, 19, 20, 39) are justifiable. The results of several studies on the pre-hospital emergency systems in Iran (31, 46, 47) are similar to those of the present study. Therefore, it is essential to take fundamental measures to train employees and use skilled manpower in pre-hospital emergency medical services. In general, despite the increases in the number of road accidents in Iran, the death rate has been shown to decrease and the performance of emergency medical service has improved. However, most indicators are far from the international standards (37). Emergency medical services are growing rapidly worldwide and undergoing continuous progress and evolution. This evolution and development is also necessary in Iran. In particular, attention should be given to studies on the infrastructures and outcomes of emergency medical services in Iran, which were investigated in this study as the structure and function, is necessary. In addition, it is essential to conduct extensive studies on emergency medical services and the impacts of recent developments in related education and training In Iran. Evidently, the number of studies on pre-hospital emergency services conducted in Iran is limited. To promote public health, the consideration of prevention areas, process of providing pre-hospital emergency services, policymaking, foresight, adoption of a systemic view, development of comprehensive research programs and roadmaps, and research needs assessments in pre-hospital emergency seem necessary. The researchers thank the health management research center for their kind cooperation with the researchers in collecting and analyzing data. Authors’ Contribution: Mohammadkarim Bahadori and Fatemeh Ghardashi equally contributed to the study and design as well as developed the methods. Ahmad Reza Izadi and Ramin Ravangard wrote the primary draft of the manuscript. All of the authors contributed to the revision of the manuscript and have read and approved the final version.